the one where Del Monaco sings act II? It's great. Finally ordered this one and can't wait to get it. This one I second as a classic too. I really find Domingo in fine form here. And of course, the rest of the cast is legendary. I already have this one and like it. You should save also for the Muti, drama in optimal format. Really? haven't heard much about it. What do you like about it? The final stop in my journey through Goethe’s world translated into opera, what it has to do with his novel “Faust”. I watched the live performance of an opera composed and written by the famous Verdi librettist Arrigo Boito, who reacted to both Berlioz and Gounod’s operas and tried to show his own point of view. 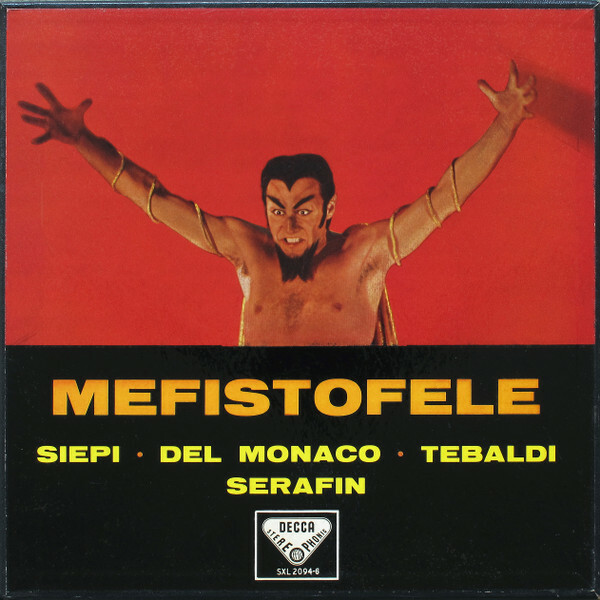 This time the main character is the devil Mefistofele and this is the only opera composed in Italian, which opens the door for lots of singers in the 20th century. I’ve read about Boito that he didn’t like Gounod’s romantic approach in his opera and thus his story focuses in much more traits of the characters as deceit, contemplation and the two kinds of love: passionate and platonic. I did watch these traits in the DVD performance, but I began to reject the opera on video and in audio recordings as well. The reason was the plot structure and whole musical approach that Boito gives. The story focuses on the Devil, and thus the Prologue is filled in a spectacular aria and choral section. But when the plot and music develop from Act IV, once Margarita has rejected Fausto to save her life, apologize and embrace death, my mind switches off. The story goes in circles around a second love story in fantasies between Fausto and Elena di Troia without Mefistofele doing much, until Fausto finally quits the Devil in the Epilogue with the Bible. Musically, it’s so focused in the title character’s key moments that from Act II I struggle to go on. It’s the same structure as Gounod’s Faust but quite unbalanced and with more spins after Margarita’s death. 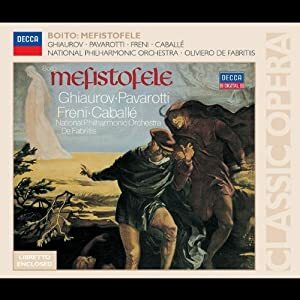 Of the few recordings I have tried, I lost all interest with the tender and sweet interpretations that delivered Plácido Domingo and Luciano Pavarotti in the modern recordings by Julius Rudel and Oliviero de Fabritis. Rudel’s recording is out of fashion for their odd sound effects and quickly became my bottom recording. 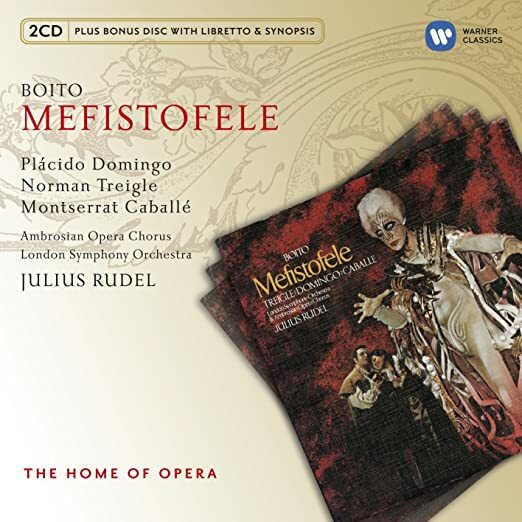 I don’t like Treigle as Mefistofele either. The Fabritis set is more even in the cast with the exception of 80s Luciano Pavarotti, whose voice is too tender to portrait an old doctor in Act I. Ghiaurov performs really well, but I become bored in a while. In a middle level, the only commercial edition of the opera that is on print is conducted by Riccardo Muti in Teatro alla Scala for the RCA label, led by a competitive Samuel Ramey but with partners that doesn’t do justice to the composition (Crider and La Scola as Margarita and Fausto). The vocal recording seems odd, convex, like it doesn’t push forward. I liked the orchestral sound however. I didn’t go further than Act II. 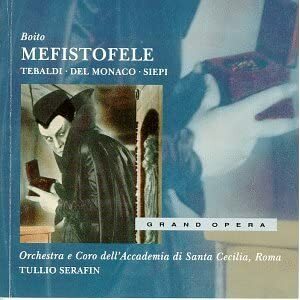 The only recording that excited me in the whole work, given its sound and vocal quality, was the first complete stereophonic try by Tullio Serafin in Santa Cecilia counting with Mario del Monaco’s imperial Fausto, instead of Giuseppe di Stefano, who recorded his parts the previous year and whose rare performance has been recently edited by Eloquence (B07B12HY1X). I was very pleased to be enjoying the opera in the tough Act IV with the powerful Cavalli as Elena di Troia. The chorus and orchestra is really well-recorded for the year 1959, without fireworks but a lot of detail and close microphones. Renata Tebaldi is slightly dark for the Margarita role but she pulls through it. Cesare Siepi is incredible as Mefistofele and Danieli works out as Marthe. It’s the lone winner. Picked this up at the library sale for $2 a few months ago. Never heard this opera before. Listened to it once and stuck it aside. Thanks to this thread, I just sampled it and like what I hear, so I will give it a spin sometime this week. Last edited by Fritz Kobus; Jun-12-2018 at 05:34. My favorite opera. Without a doubt if you can find the historic Olivero/Campora/Hines grab it. There aren't many out there. I was lucky to acquire it. If you cannot find it, next best is Treigle/Domingo/Caballe. Last edited by nina foresti; Jun-12-2018 at 12:35. I haven't. We'll see how this opera sits with me. Often if I like an opera very much I will buy multiple sets. Did you enjoy listening to this? I just ordered it from Amazon and I am having second thoughts. Wondering if I should have ordered a different one.